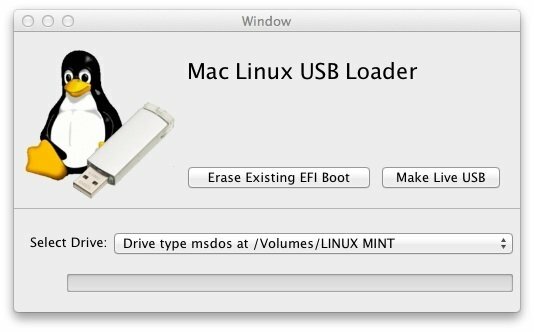 Loading distributions of Linux from a USB flash drive on a Mac is possible with Mac Linux USB Loader. With this tool you can easily boot a Mac with a Linux distribution. Macs require to boot via EFI which makes it difficult to use Linux if not through GRUB. It is also quite possible that there may be problems on a Mac with some distributions. That's why we need something like Mac Linux USB Loader, a tool that enables us to install a Linux distribution with an EFI boot loader onto a USB from an ISO image that will enable us to enjoy Linux on a Mac. Mac Linux USB Loader is the long-awaited solution to an important need. And that is because applications that are intended to create LiveUSBs to load Linux distributions are generally made to work with PC's and not Apple machines, which have more complex needs for this purpose. Why make things so complicated? If you use Linux on a Mac then don't hesitate to download Mac Linux USB Loader.